Will all the talk of champions trying to have 'Winner Takes All' matches go anywhere? After successfully defeating both Charlotte Flair and Ronda Rousey for both of the women's titles in the main event of WrestleMania, a lot of other champions have tried to have 'Winner Takes All' matches. 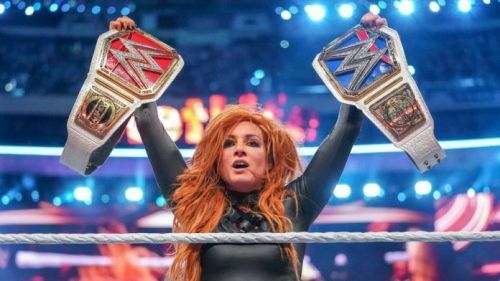 Because she was officially the first to win such a match post-brand split, Becky Lynch was recently asked about what she thought about possibly unifying the titles. WrestlingInc.com carried transcripts of her interview with Gorilla Position. Well before Lynch won both titles at WrestleMania 35, WWE superstars like Chris Jericho at Vengeance in 2001 and Randy Orton at TLC in 2013 were unified champions. Lynch's WrestleMania success propelled Kofi Kingston to challenge Seth Rollins on Raw the next night in their own potential unification match, but it was interrupted by the Bar. Whenever two titles are up for grabs in a match, if they aren't immediately unified right after the match then talk always to making the two titles one. Lynch was asked about her thoughts on this since she was now Becky Two Belts. There was a lot of backlash when Charlotte Flair won the SmackDown Title two weeks before WrestleMania because while it added yet another layer to the main event, it took away another opportunity and match for the rest of the ladies of the roster. Raw's women's roster currently has 14 women and SmackDown's has 11 women in its ranks, including the champ. While the rosters will obviously change due to the Superstar Shake Up, regardless of the numbers, both brands need something to fight for. After the 'all or nothing' match at 'Mania, Kingston and Rollins tried to do the same on Raw and Curt Hawkins and Zack Ryder have already challenged the Hardyz in their own 'Winner Takes All' match. It appears that one of Lynch's challengers will be Lacey Evans due to the altercations the two had on the Raw and SmackDown after 'Mania. Which title she challenges for is up in the air at the moment. The titles should definitely not be unified in a time when the rosters are as deep and full of talented women as it has ever been.